Maybe traveler Jbernhardt was surprised to see Space Invaders Alien Sculpture at Sopporo and Otaru Snow Festival 2008 and why wouldn’t he? Space Invaders Alien is a character of a old retro game Space Invaders which originated in Japan and is no cultural or mythological figure to be presented at a traditional annual snow festival of Japan. On second thought its not surprising since Japan is a known for its geek culture and most modern gadgets and games have been created by Japanese geeks. Also virtual and all amazing characters, logos, icons have invaded our consciousness so much that they are becoming part of the real world culture too. What does still surprise me why sculptor wanted to sculpt an anti-character, an alien who is shot down mercilessly? Maybe he wanted to make statement against some sort of cultural invasion which should be resisted. 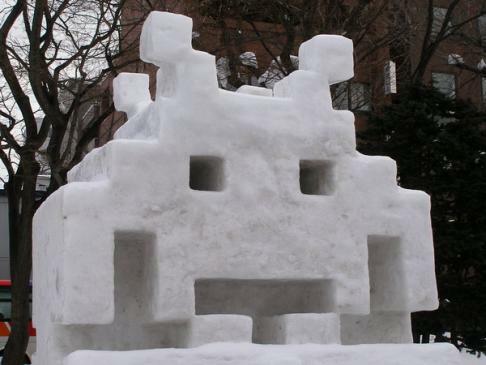 Whatever it is, the Space Invaders Alien snow sculpture is standing tall at the annual snow festival looks awesome and is done flawlessly. It indicates that times indeed are changing and virtual world is becoming more real. Be it movies or art or product designs virtual games and their characters are finding their rightful place in the culture milieu.